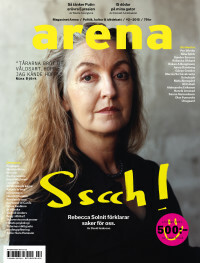 Arena is Sweden’s independent magazine for in-depth political and cultural debate. Current ideas and intellectually demanding. Arena publishes 6 issues a year. Arena is produced by Arenagruppen and is run by two Editors-in-chief, Mikael Feldbaum and Malena Rydell. Please contact us for inquiries about Arena.